The Arch: What’s in a Name? I am old enough that I recall a time, fifty years ago, when a television was wheeled into my fourth grade classroom and we were allowed (or forced, depending on your perspective) to watch the last piece of the Arch being placed. It was a historic moment largely lost on us kids, who found it mostly yawn-inducing. It seemed to take forever. But now, as the fiftieth anniversary of one of the world’s most striking and meaningful monuments is upon us, I am happy to have been afforded the opportunity to see it. I heard yesterday that there is still lingering discontent on the other side of the state about the placement of the Arch. 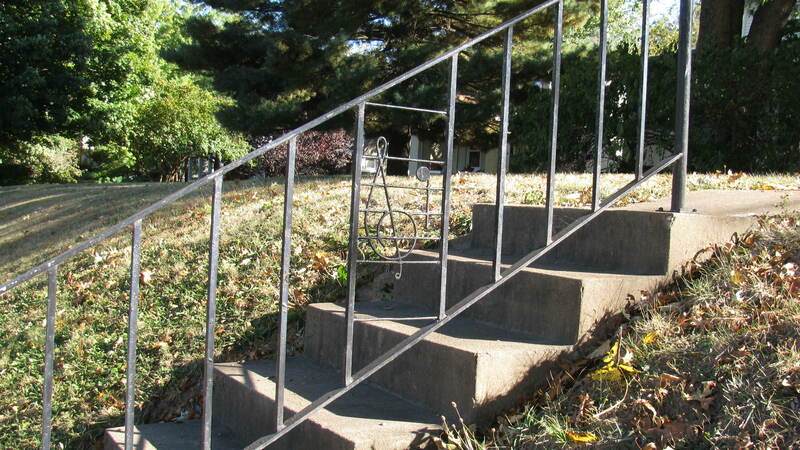 Kansas City, some believe, is the actual gateway to the west. More wagon trains departed for points west from Kansas City than from St. Louis. Maybe so, but most of those people provisioned in St. Louis before heading that way, so where do you draw the line? It is also noteworthy that the Arch is officially known as the Jefferson National Expansion Memorial. It commemorates Thomas Jefferson’s purchase of the Louisiana Territory, and the fact that Lewis & Clark departed from St. Louis on their famous expedition. So you couldn’t put that in Kansas City. We have many books in the library on the Arch. The Making of an Icon, by Jim Merkel, Historic Photos of the Gateway Arch, by Nini Harris, or The Building of the Arch, by Robert F. Arteaga are just a few examples. There are also a number of great DVDs to watch about the history and the building of St. Louis’s premier monument. When you look these things up in the library’s catalog, you can look under the subject Gateway Arch, or the subject Jefferson National Expansion Memorial. Both names work. I for one have never thought it belonged anywhere except in St. Louis. What do you think? Yesterday Tom Cooper, Emma Delooze-Klein and I gave a talk at the Kirkwood Public Library about our recently published book, Images of America: Webster Groves. We spoke about our favorite pictures and told some of the back stories – how we got the picture, why it was taken and so on. One of the images I talked about was the picture of Hans Lemcke and his band of young musicians at Bristol School in 1929 or 1930. Hans Lemcke was a music teacher in Webster Groves for 37 years but before that, he was in a band directed by John Phillip Sousa. The story goes that Sousa would visit Hans Lemcke in his home. While we were working on the book, I checked the census records and discovered that the Lemcke home was right across the street from the lot that would one day become the site of the Webster Groves Public Library. As often happens when we give talks about the book, yesterday we learned something new. A woman came up to me after the talk and said that she used to take music lessons from Mrs. Lemcke in the Lemcke home. 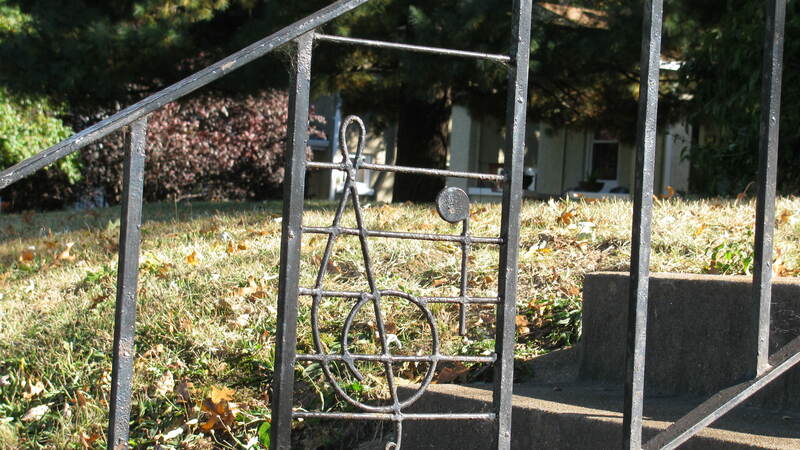 And unless it had changed, the railing from the sidewalk up to the house was decorated with a treble clef. As soon as Tom and I got back to the library, I checked to see if it was still true. It is! If you would like to read more stories about the history of Webster Groves, check out our book. Copies are also available to buy at the library. This morning I learned that famed Louisiana chef Paul Prudhomme had died. He was seventy-five. I pondered whether this was news for a library blog, but the fact is there are so many reasons that make it so. Paul Prudhomme rose to fame in the 1980s, introducing the world to his creative take on Cajun cuisine. As a matter of fact, it was through Prudhomme that we learned the difference between Creole and Cajun food, a distinction first pioneered by Justin Wilson and other cooks. Prudhomme worked at the very beginning of the foodie revolution, the sudden interest in ethnic and regional cuisines, in using only the best, fresh ingredients, in shopping locally, and his food epitomized all of that. So did his books. Chef Paul Prudhomme’s Louisiana Cookbook, The Prudhomme Family Cookbook, Seasoned America and several others were hugely popular books that taught many of us basic techniques we still use today. It was from him that I learned to season a spicy dish with black, white and red pepper for a full flavor experience, and to saute my spices for a moment before adding liquids to the pot, to bring out their bouquet. I could go on, and I’m betting many of you could too. Paul Prudhomme was in the vanguard of great cookbook publishing. For several decades now, cookbooks have been one of the most popular non-fiction genres in libraries. Sure, now you can look up a recipe for shrimp etouffee or chicken creole on YouTube, but there’s something still comforting, and frankly more deeply educational, about having a great chef’s whole book before you, to read all the little tips, the whys and wherefores of why you are advised to cook a dish this way. One of the best meals I ever had was at Prudhomme’s flagship New Orleans restaurant K-Paul’s Louisiana Kitchen. I still remember it—a meal that began with his signature rich gumbo, followed by a whole crispy fried trout stuffed with crawfish. I hope the restaurant continues to put out great food, and that library users continue to check out and learn from his wonderful books for a long time.